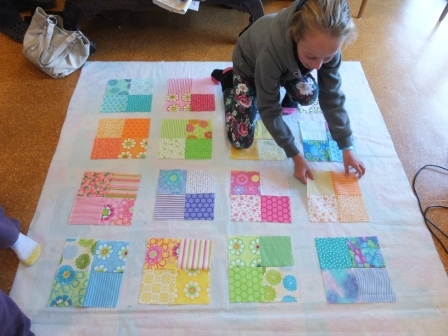 Last Friday Miss 7 decided that she wanted to come to Friday Quilters with me to "sew a quilt for her bed". We took along her sewing box ("the BEST birthday present, Baba"), with her stash in it, and got into some serious planning mode. My lovely friends donated some extra bits (Thanks heaps lovely ladies) to augment her stash, and with her charm square pack, we were away. 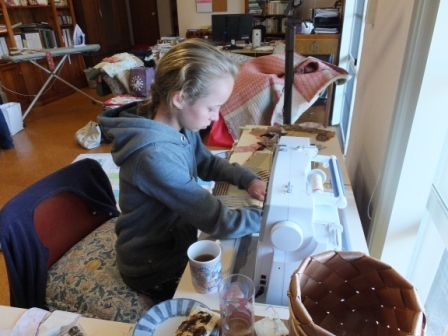 So by Friday midday, all the fabrics were cut out, laid out in 4-patches, and Ruby had sewn 5 of the 4-patches together. I left the pack with her over the week end, thinking that one or two more might be done before next Friday. Well Sunday night Michelle phoned to ask if she could come by the next day so that I could cut the sashing for Ruby, as she had finished sewing all the 4-patches. Fabulous! Monday morning they all came over, and we all worked on the layout on my "design wall" - a flannel back plastic tablecloth which I find works a treat. You can roll it all up and take it with you to a quilt day, or simply for use it for storage until you can get to sew again. Morning tea, and the younger girls decided playing cards was better value, but I could see that Holly was itching to get behind the sewing machine. Not a good idea to sew Ruby's quilt, so I dug out a pack of blocks I had precut some time ago as a charity quilt for Stitching Hearts, and set Holly to work on that. So I cut sashing for Ruby's quilt, Holly sewed, and Michelle made a label for her quilt. Tibby supervised proceedings from my chair. 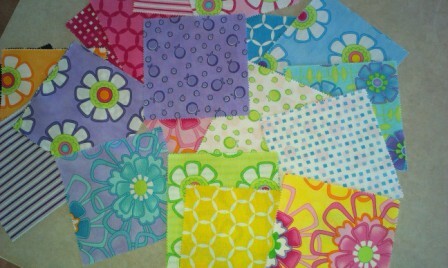 Holly, bless her, put together almost all the blocks for a lap quilt, so now all I need to do is sew them all together. Here is a selection of them. 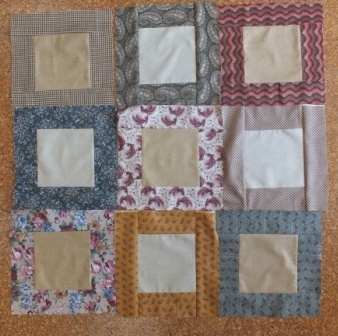 The blocks came about in the first place, because I found a bundle of 6" squares in the charity cupboard. 6" squares are actually quite hard to deal with as there isn't much you can do with them. Its a difficult size for being alternate blocks to pieced blocks, and you can't make HSTs from them, as the resulting block ends up a weird size. So this is what I came up with. The sashing on them is a pile of 2 1/2" strips from my precut strips bag cut to fit. So win, win. 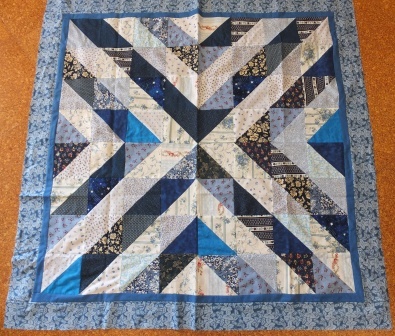 Squares are used, and so are a bunch of strips, and a charity quilt to boot. Update on Ruby's quilt tonight is that over half the sashing pieces are now sewn on! What determination from a 7 year old. Way to go Ruby! 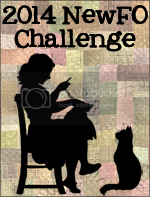 I have suggested that she enter it in the local quilt show next year. On Saturday Di, Elaine & I wandered off to the Charity Quilt show which was held at Wyong Racecourse. The charity this year was Cancer Care Services for Gosford & Wyong Hospitals. It was a first for me as it has always fallen on a date I couldn't make previously. So pleased that I made it this time, as I loved it! It was a pretty location, and a glorious day, with nice mid 20s temps and the sun smiling. There were﻿ a couple of tables of crafty stuff out front, before you entered. 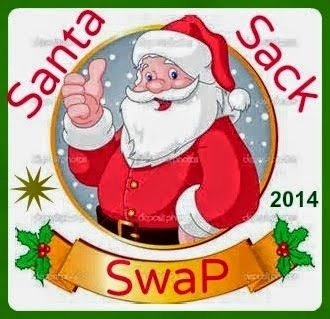 Mostly recycled, some toys, and some beautiful silk scarves. I picked up the cutest poncho for Miss 7's doll for $3. There were other dolls clothes on display as well, but the poncho was the one that took my fancy. Once inside there was an area for traders, with quite a variety of quilty stuff, notions, a bit of fabric & even a table with hand made chocolates. I was strong and walked right past those LOL. The traders were all local shops, so sadly not a lot there. Blueberries is in Wyong, and probably our best local shop, although it is quite a trek for me. I added to my collection of Civil War fabrics from their stall. Must get a move on and start this quilt I have been collecting fabric for, for so long. Frankensteins Fabrics is at West Gosford, and that is very much closer to me. They have a huge range of modern brights. I didn't see Janelle from Pieces to Treasure which is at MacMasters Beach, or Carol from Cherrypie Designs from Somersby. Shame as that would have really increased the variety on the traders tables. Upstairs there were about 100 quilts hung. A huge variety of styles and colours. If I were being mean, I would say that the quilts were all hung too close together to be able to view them properly, but that is not the fault of the quilts themselves. Perhaps the organisers of future events need to think of a larger venue. It was not a judged show, although there was a "viewers choice" category. I took a few photos of the quilts which appealed to me most - here are some of them. This quilt was absolutely stunning! So simple, as it is just half square triangles, but doesn't the placement look fantastic. Loved the vibrant reds and whites and the quilting was beautiful. So suited to the design. This was another hand pieced, hand quilted diamonds & hexagon medallion. Can you see the quilting in the centre? Parallel lines at right angles, about an inch apart. I took a close up of one of the border stars below. This was just fabulous quilting with the feathers radiating from the stars. The fabric on each diamond was carefully fussy cut, so there were secondary designs on all of the stars. You can't tell that I love the hand pieced traditional quilts in soft colours can you? I should really have taken a photo of the quilt lable so that I could note the name of the quilt & the quilter. That's something to remember for next time. We bumped into Jan & friend in several places. That is the nice thing about living in a small town - you bump into people you know everywhere. Thank goodness I'm not having an affair. After doing the rounds of the quilts we collapsed in the cafeteria for a bit of lunch. Lovely day. Thanks Di & Elaine for a great day. 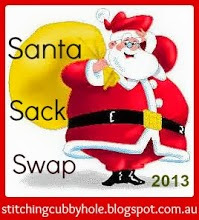 "2013 Creative Pay It Forward: The first five people to comment on this status will receive from me, sometime in the next year, a gift - perhaps a book, or baked goods, or a candle, or something handmade - a surprise!! There will likely be no warning and it will happen whenever it strikes me. The catch? Those five people must make the same offer in their FB status!!" I thought this would be a fun thing to do, so I posted my invitation on FB. A few friends joined me when I posted my invitation, and then I had to come up with something creative for each of them. Two were quite easy, as they are local, and I am planning to give them a jar of my special tomato chutney, which I have already made, together with the recipe. Everyone who has tasted the chutney absolutely loves it, so I am hoping that these two friends will too. And in case you are interested, here are the instructions. Scraps of pelon - fusible pelon would be easier to use, but I had some scraps of ordinary pelon which I wanted to use up. Some sort of motif fussy cut from a feature fabric which fits in a 5" hexagonal shape. Embroidery floss to tone with your background fabric. Fold your background fabric right sides together. Draw around the 5" hexagon template with a pencil on the reverse of your background. This is your sewing line. Using a pencil & quilter's ruler, mark a line 1/4" from each edge of the hexagon shape (cutting line). Cut out the two layers of hexagon background on this outer line. Fussy cut your motif. Don't you just love those teapots? I actually have a small collection of teapots in various shapes & sizes, but nothing like htese ones! If you are using fusible pelon, iron it onto the reverse of you background fabric, within the sewing lines. If you use plain pelon as I did, just pin it to the background. 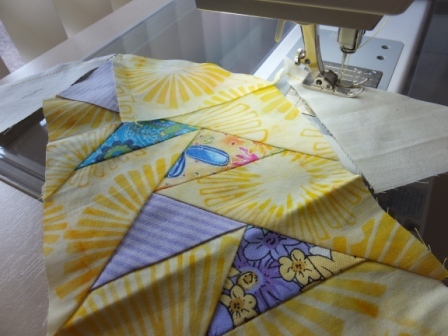 Sew around the hexagon on 5 sides using a 1/4" seam. Just kiss the pelon with the seam in one or two places if you are using plain pelon, to anchor it for easy turning. Poke the seam allowance inside the opening of the hexagon. Topsew just inside the edge of the hexagon, on all 6 sides. Finish off by burying the threads in between the layers of fabric. You can either use needle turn applique or fix it to the mug rug using buttonhole stitch. This is the part of the mug rug which is going to get the most wear, so I recommend that you turn a small hem under even if you are planning to buttonhole the motif on. This will give stability and protect it from fraying. My motif is printed on the bias, so for me, turning a hem gave the edges some stability as well. 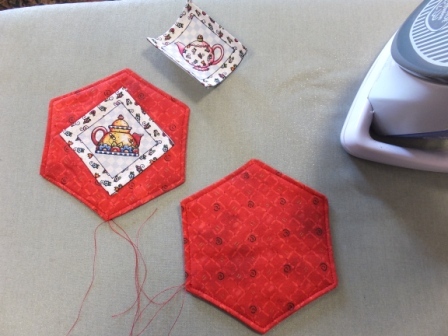 Either fix the motif to your hexagon with fabric glue, or use scraps of fusible webbing. I am planning to put a little parcel together with the mug rug, a story of the history of Billy Tea in Australia and, as I can't make these o/s friends a cup of Billy Tea, a tea bag with which to make a cuppa for themselves. The teapots in the motifs I have used is pretty fancy, and nothing like a Billy, but they will just have to make do. I had such a busy day yesterday! I just love the yellow in this. I have only been using yellow for a short time, and now I wonder why I haven't used it more in the past. [Note to self - buy some more yellow fabrics] After putting this border on to the quilt top, I framed it all with a 1" purple border. So pleased with the result. Having finished that, I decided that my workroom needed a cleanout. It does get a regular once over with the vacuum cleaner, but I thought it needed more than that. Our vacuum cleaner has bitten the dust, so I had to borrow my daughter's, and with the help of the lovely David, we shifted all the furniture, got in behind everything, the floors of the cupboards & the tops of the bookshelves. Then I emptied all the drawers of my sewing cabinet and vacuumed in there, and sorted and replaced everything. My cabinet has open drawers on the side, and as it stays open all the time, the drawers get filthy with fluff 'n stuff. Also got out a damp cloth and wiped over heaps of the surfaces. Didn't get to dust the bookshelves though. That will have to wait for another day. I had decided some time ago that my stash cupboard needed reorganising. I had lots of green shopping bags with stuff like UFOs, Patterns etc. in them. I had them stacked in the centre shelves. The smaller pieces of fabric were in big tubs on the floor of the cupboard. Well that is daft, as the things that get used most are the small pieces of fabric, and the precut strips & squares, and they were on the floor in heavy tubs. So yesterday I took everything out of one side of the cupboard, and restacked everything. The lesser used stuff is on either the highest shelf or on the floor, and the frequently used stuff is stacked neatly on the middle, more accessible shelves. Still a bit disorganised on that side, but I'm getting there. I still have to do the other side too. When both sides are done, I will be able to take some of the stuff off the floor & all the surfaces too. Then I decided to put a border onto a charity quilt which had been made a bit small. I put on a 1" framing border in mid blue homespun and a 3.5" floral border in a pretty blue. I love how this has turned out. Didn't Jan do a great job of the centre? So that was my day yesterday. I was totally pooped last night. Flopped down in front of the TV with my hexies. 'Til next time........ Keep on stitching. I am struggling with the border I am putting on to the Round Robin my sewing group is doing at the moment. Am I putting off going to my machine to keep piecing?? Of course I am not, this is a terribly important function I am performing right now (grin). I decided to do a Migrating Geese pattern for this border, which looks wonderful, but it is taking me a month & a day to construct, let alone all the cutting involved. So far I have pieced 3 sides. I am planning to put plain corner squares in the each of the four corners, mostly because I couldn't work out how to turn those pesky corners! 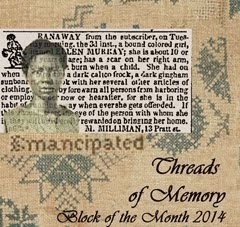 I am not sure whether I will simply use some of the fabrics in the quilt itself, or add in a new fabric altogether. 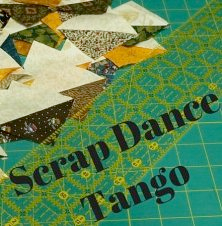 It is currently on the floor, my design wall, with various bits of fabric folded into the corners while I decide. I can't show pictures as I know that at least one person from my group comes by every so often, so until the day of the Big Reveal, I can't put up the photos I have taken along the way. Perhaps a series of posts on the Round Robin is on the cards in May once we have given the RR back to its owner. On another note, I received a wonderful letter today from my Aussie Hero who received the quilt "Adventures in Black & Yellow" which I posted off in February. He has included a photo of himself with the quilt. 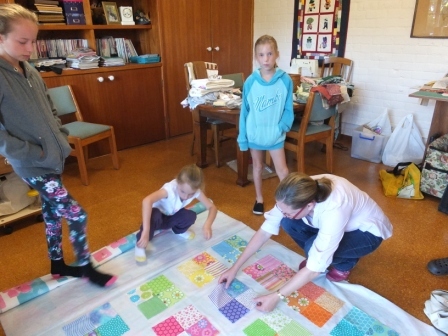 It is so special to see the face of the person for whom you have made a quilt! There is a great big tank behind him, so the splash of colour looks good. He has been in the Australian Army for 6 years. Prior to that he was in the Staffordshire Regiment, whose colours are black & yellow, so that is why he asked for those colours. I went down to Jan-Maree's (co-ordinator of Aussie Heros) yesterday. The weather was apalling! Torrential rain, and visibility was poor. Quite scary driving the F3 in those conditions, so I made my way down in a fairly sedate fashion compared to my usual blat down the freeway. There were only a couple of us there, but we still managed to churn out a fair bit of piecing. JM had us piecing backings to start with, then in the afternoon, we pieced blocks. Well, I can't procrustinate any longer. Geese: Watch out, here I come! Last week we went to Queensland for a family wedding. The week prior to our departure was absolute chaos. This old gadabout was out and about pretty much every day so things simply had to be put aside. So what has that got to do with hexies you ask? Well I was packing the afternoon prior to us leaving, and horror of horrors, no take along project to pack! Now I never leave home without some hand sewing to do, so at the last minute, I grabbed some 3/4" hexagon papers and a couple of fat quarters to work on. At the time, I had no idea what I would do with them. I just figured that if I made a few, I would work out how to use them. So here is what I managed to do while we were away. Not much really, but we didn't have much time at home. The fabrics are all from my stash. The floral print at the top I bought at the National Quilt Championships, in Surrey in June 2011. The other floral came in a pack of about 4 coordinating fabrics from Country by Design, Mosman (now closed unfortunately) about 1995, and the blue floral I have had since forever in my stash. Pleased as punch that I am using it all. I managed to coerce my beloved to stop at a quilt shop on Saturday. The first one I tried was shut as it was Easter Saturday, but the second one was open. It was an absolute Aladdin's Cave! Bran's Fabrics in Warana is housed in a warehouse in an industrial area, there were bolts and bolts of fabrics. Fat quarters, ends of rolls, precuts & notions. Quite a lot of dress fabrics too. I bought a piece of soft grey tone on tone, and I think I will applique the hexagon rosettes onto this as background. 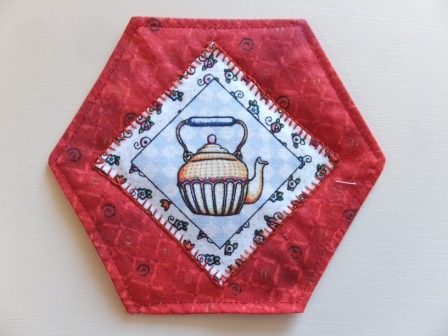 My thinking at the moment is that I will make a 9 patch of hexies, and use that as a medallion centre. Big dilemma now is do I sash the 9 patch or not. Will have to play with the fabrics to see how things pan out.